New Jersey’s diversity can be found throughout the state in close-knit ethnic communities. Visitors can eat, shop, and partake of their customs. Ferry Street (or Portugal Avenue) in the Ironbound section of Newark is the heart of Portuguese activity in the state. Terracotta-roofed restaurants and cobblestone sidewalks mob this main thoroughfare that embodies the relaxed and romantic appeal of the Mediterranean countries in Europe. home-style cooking and Portuguese hospitality at the neighborhood favorite Sol Mar Restaurant (Ferry and Niagara streets). Probably the most Portuguese restaurant in town, pick from the busy bar area (reminiscent of the “tasca” or tavern) adorned withtraditional blue and white mosaics or its more formal addition Vila Nova do Sol Mar. “By maintaining tradition, I’m doing my job right. The best way to do cuisine is to do it the old fashioned way,” Antonio Nobre, owner for more than 13 years, says. Vila Nova, which is set like an outdoor café (but indoors), is illuminated by street lamps nestled in handset “calcada”—cobblestone flooring inspired by Lisbon’s own streets that feature patriotic etchings. The codfish dishes are the standouts on this menu. If grabbing a quick bite instead, visit Teixeira’s baking plant and storefront (Kossouth Street). 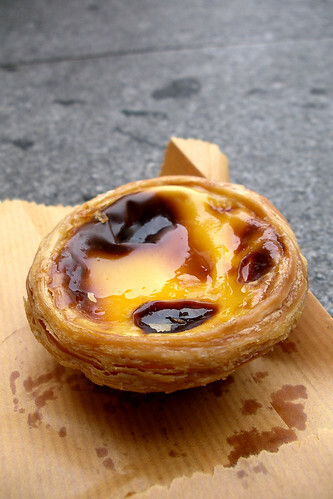 Pick from the coveted custard cup (pastel de nata) or a sandwich in the beloved Portuguese roll and an aromatic espresso concoction. To recreate an Iberian menu in home kitchens, a stop at A&J Seabra’s Supermarket on Lafayette Street can provide the necessary ingredients like dried and salted codfish and spices. “I come here because it’s our people. It has everything we could want from Portugal,” says Manuel Ferreira, visiting from Manhattan. Food isn’t the only reason to visit the Ironbound. Gift shops offer a one-of-a-kind shopping experience. Two Ferry Street gift shops, Tucha and Portugalia, offer a treasure trove of imported porcelain, pottery and soccer memorabilia. The annual Portugal Day Festival, generally on the second weekend in June celebrating renowned poet Luis de Camoes and Portuguese communities around the globe, is an excellent opportunity to sample the community in one shot. But as the Portuguese altered the city’s landscape in the early 1900s (then occupied mostly by the Polish, German, Italian and Jewish) to work on the thriving railroads, a new wave of immigrants, especially from Brazil and Mexico, are adding their own flavor to the community these days. Still, the Portuguese footprint is indelible and marked by ambitious projects like an active social club and The Luso-Americano newspaper, which was founded in 1928 by Vasco Jardim and remains a major news source for Portuguese residents in and out of the state. Pay a visit and like in Portugal, you’ll be welcomed by Mediterranean hospitality.